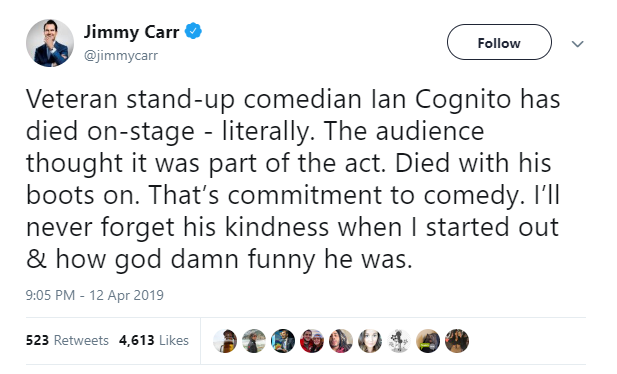 Ian Cognito died on stage from a heart attack. 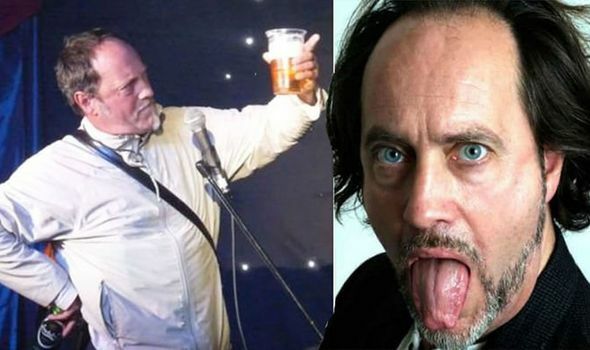 On Thursday the 11th of April Ian Cognito a famous comedian was pronounced dead. The 60 year old man was performing on stage when he suddenly felt the need to sit down and take a breather. This then lead him to be silent for 5 minutes then later passing away. The crowd at The Atic Bar in Bicest at first thought it was a joke and continued to laugh unaware what was actually going on. South Central Ambulance Service announced that he was confirmed dead later on the scene. According to audience member John Ostojak "Only 10 minutes before he sat down he joked about having a stroke. "He said, 'imagine having a stroke and waking up speaking Welsh'." "We came out feeling really sick, we just sat there for five minutes watching him, laughing at him." The audience was then evacuated. Ian Cognito's real name was Paul Barbieri he was born 1958 11th of April in London. The comedian was compared to Lenny Bruce, Bill Hicks and Jerry Sadowitz. He never really achieved any mainstream success and this was due to his short tempered personality. Cognito did manage to win the Time Out Award for Stand Up Comedy in 1999. 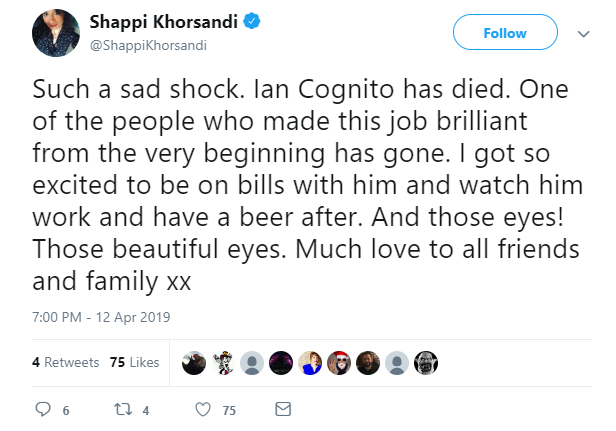 Some of Cognito's fellow comedians took to twitter to express their condolences for his death. During the show itself Cognito even jokes about dying on stage. During the act he said "Imagine if I died in front of you lot here". According to Mr Bird, Cognito said he felt a bit ill before he went on stage but carried on being his normal self. Mr Bird who runs the Comedy Club at the venue said that he thought he was joking the whole time and when he walked up to Cognito on stage he was expecting him just to say "Boo". When it was found out that Cognito wasn't joking around everyone was evacuated and the Police and the A&E were sent to the venue as quick as possible. Mr Bird did say that this Cognito dying on stage would be the way he wanted to go besides him wanting more money and it to have happened in a bigger venue. Our thoughts and prayers go out to PAUL BARBIERI's family and friends.